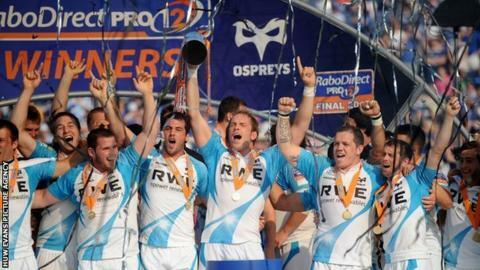 Ospreys have calmed fears over their finances after the region was listed in the High Court in London on Monday. The day after winning the Pro12 final at Leinster, Ospreys faced a winding-up petition from Her Majesty's Revenue and Customs over an outstanding tax debt. The case was adjourned until 30 July and the Welsh region says that both parties are confident that an amicable solution to all matters can be reached. "The region's position with HMRC is being resolved," read a statement. "In light of the discussions which have taken place with the region, HMRC agreed to adjourn the hearing of the petition in significant advance of the hearing. "Both parties are confident that all matters will be resolved shortly." The Ospreys regional rugby side was originally created by an amalgamation of Swansea RFC and Neath RFC, with those two clubs continuing as semi-professional sides in the Welsh Premiership. The news comes a week after Neath RFC escaped a winding-up order at the High Court after settling a dispute over unpaid tax, and the same day that football side Neath FC were wound-up over unpaid tax.